The Central Pennsylvania Chapter recognized outstanding communications programs with its Keystone Awards at the annual banquet on November 19. The programs that won the awards and honorable mentions were selected by the San Antonio Chapter of PRSA. La Torre Communications won a Keystone Award for Reputation/Brand Management (Nonprofit Organization) for Project Share – Nonprofit food pantry strengthens communications in 30th year. The United Way of the Capital Region won a Keystone Award for Public Service (Nonprofit Organization) for Road Map to the Future – Driving Change. The United Way of the Capital Region also won a Keystone Award for Publication (Single-issue Newsletters/Booklets/Calendars) for Life in the Capital Region 2014 Assessment of our Community – Executive Summary. RETTEW won an Honorable Mention for Feature Stories for wastewater treatment feature articles. Millersville University won an Honorable Mention for Crisis Communications (Associations/Nonprofits) for Student Death on Campus. Diakon Lutheran Social Ministries and Diakon Child, Family & Community Ministries won an Honorable Mention for Community Benefits Report for its Currents for Good newsletter. Diakon Lutheran Social Ministries and Diakon Child, Family & Community Ministries also won an Honorable Mention for Annual Reports (Nonprofits) for Taking Two Paths. La Torre Communications won an Honorable Mention for Public Affairs Association/Nonprofit Organization for LeadingAge PA’s Protecting Not-for-Profit Senior Care. Gina Masciantonio was awarded the Young Public Relations Professional of the Year Award for demonstrating exceptional leadership and professional achievements. Gina is a 2014 graduate of Millersville University where she served as chapter president of the Public Relations Student Society of America. She also served as a communications assistant in the university’s communications and marketing office. Gina is employed as a public relations associate account manager at Godfrey in Lancaster. Liz Smith, APR, MBA, and outgoing chapter president was given the 2015 Frederick E. Leuschner Award for outstanding leadership to the chapter, the community and the profession. Liz, who earned her APR in 2012 was chapter president in both 2014 and 2015. Her professional career began as director of public relations and advertising for the New Orleans Tourist and Convention Bureau. She went into broadcast consumer reporting and then went to work leading PR for BF Goodrich and the Timken Company. After earning an MBA, she was recruited to become vice president of communications for the International Copper Association. Liz currently owns a PR consulting firm and is an adjunct professor at Elizabethtown College and York College. Among her achievements while leading the chapter was starting the PR for a Day public service program. 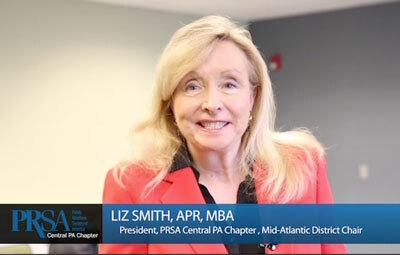 She also serves as chair of the Mid-Atlantic District of PRSA and initiated the district’s APR Boot Camp. It is the only program of its kind in PRSA. Now that she has stepped down from chapter leadership, Liz looks forward to mentoring the rising professionals in college. Frederick E. Leuschner, for whom the award is named, was president of the Central Pennsylvania Chapter in 1965 and 1966. He earned his Accreditation in Public Relations (APR) in 1970, and served as chapter accreditation chair in 1972. He took on that role again in1987 and held it for a number of years. Fred was unanimously voted the first recipient of the Frederick E. Leuschner Award for Excellence in Public Relations in 1989. He was elected to the PRSA College of Fellows in 1991 and was the first Fellow from our chapter. In choosing to name the award for him, the chapter leadership recognized that Fred had always stressed the need for professionalism and ethics. As he transitioned from mass media to public relations counseling, he established a clear need for his client’s transparency and ethical decisions. He helped many understand the clear differences between marketing and public relations. He has always been the perfect role-model of a mentor. He has constantly inspired others to be part of a professional group, the Pennsylvania Public Relations Society and our chapter of the Public Relations Society of America, and to take on leadership roles in those organizations. He encouraged many in PRSA to be active locally, regionally and nationally. Fred organized, planned, and taught the first few sets of APR coaching sessions for members of our chapter. He encouraged participants to attend coaching sessions and become part of the APR “faculty” soon after they achieved their APR. Before long, that faculty took over the organizing and teaching. Our chapter is fortunate to have had Fred’s wisdom and experience as a mentor of public relations professionals.